Hoe hoe grow: So sow ??? A new year, and this middle aged woman's fancy turns to propagators, thus kick starting the annual debate with my inner self about the best time to plug it in, and officially begin the new growing season. As a young, inexperienced gardener I would invariably start all my seeds in early January, thinking that this would mean bigger, sturdier plants later in the year. Not so. 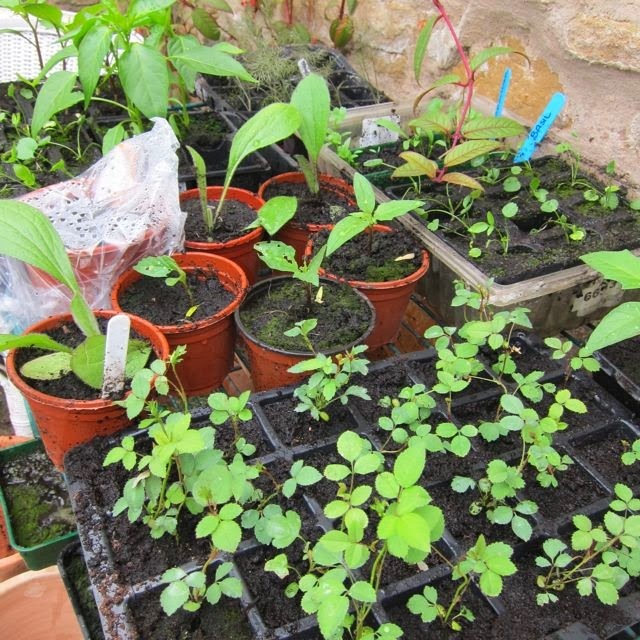 Even if my younger self got the germination bit right, I would then leave poor overcrowded seedlings in their seed trays for weeks. Inevitably they would strive for the light, growing leggy and wonky in their desperate attempts to survive. 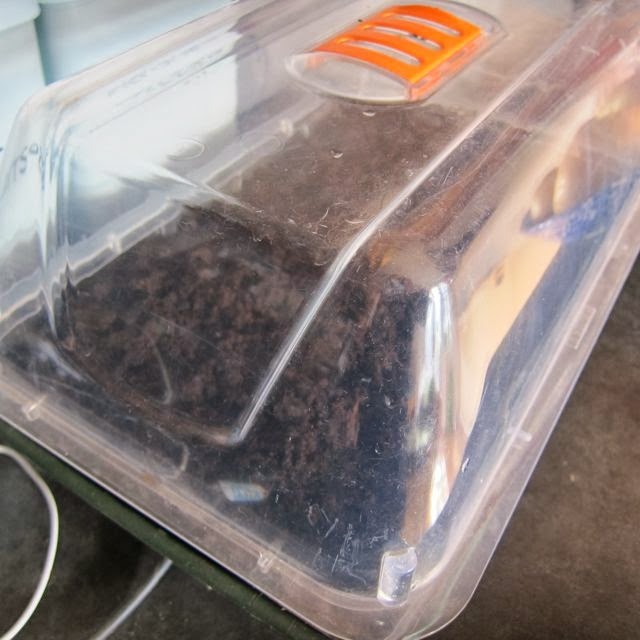 Ok, so now I am definitely older, and, one would hope, wiser, but I am always filled with dithery indecision when choosing the optimum time to plug in that propagator and grow. Because it is a controlled temperature, I never have to worry about the actual germination, unless the seeds are very stubborn. Most of my usual annual suspects germinate cheerfully, easily and quickly. The next bit is the hard bit to decide. 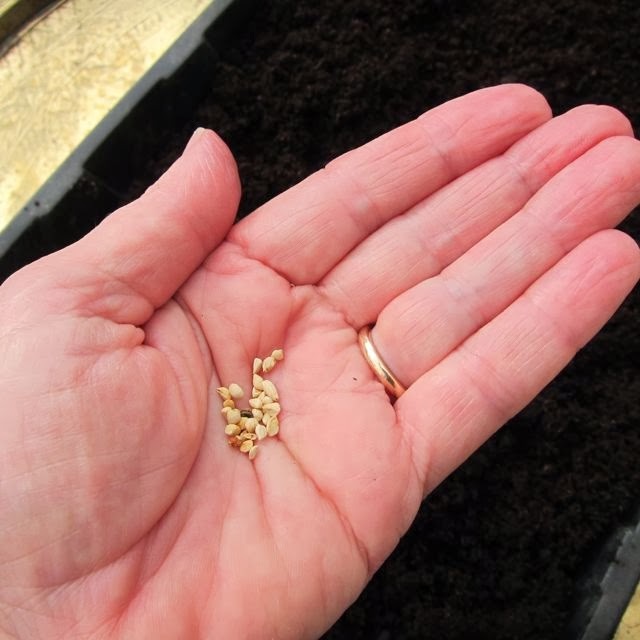 If I leave the sowing until March, then the light levels are much, much better and the temperature is beginning to rise, so seedlings grow on quickly in optimum conditions, generally resulting in good sturdy, healthy plants. Plant them in January, and they have to take their turn next to the window, vying for the light through the daytime, before being moved away from the window every evening, so that they don't get too cold. This little game of musical seed trays begins to wear a bit thin when there are legions to juggle. Some seeds need to be sown early as they need a long time to grow and mature. Plant your chillies too late and they won't produce anything until late summer, so they really benefit from a late winter sowing. The same is true for some other things too, like aubergines. An easy decision with those bad boys then. 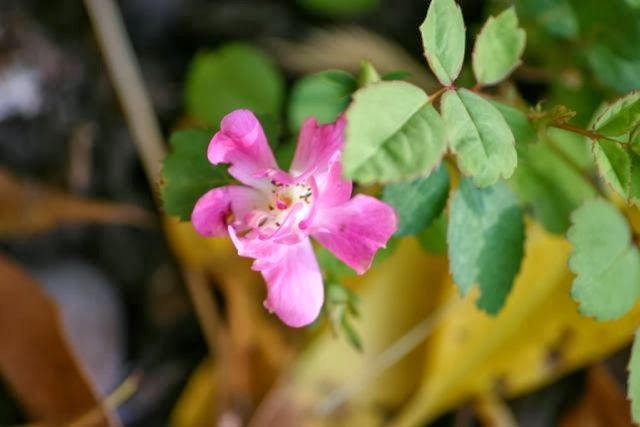 Last Spring I bought 72 plug plants of 'Rosa Garden Party' and was very impressed with the growth they put on in their first year, bulking up quickly to be full, healthy plants, covered in flowers right up to October. 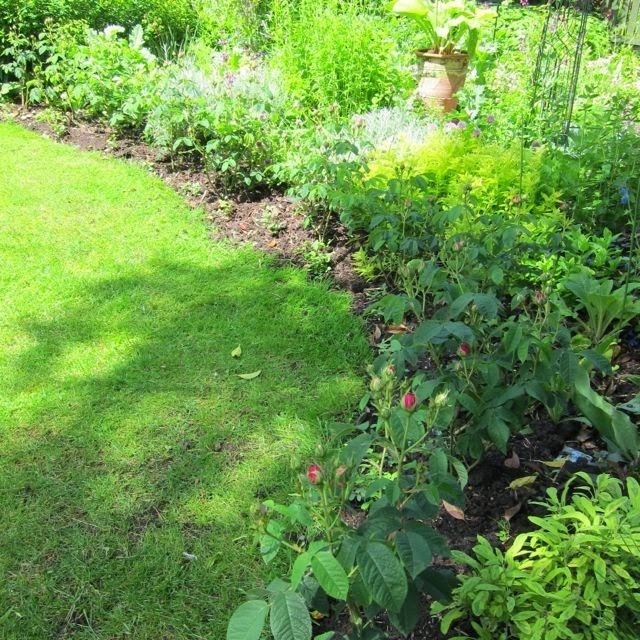 I used them, mainly, to underplant my new 'Charles de Mills' hedge, and I think it is going to be an effective partnership. I intended buying more plug plants this coming Spring, but discovered that Thompson & Morgan sell them as seeds. Better still, it is claimed that they will flower in their first season from an early planting. Of course I bought a couple of packets and began to deliberate about when to sow. I have decided to sow NOW ! Because I want flowers this year, not next. I can nurture them through their first couple of months in the kitchen, moving in an endless round from window sill to table, until they are reasonably sturdy, then, I think, they can go and live in the greenhouse until they can cope with being planted out. The greenhouse is unheated but they are hardy, so should be ok, and I can rescue them from any severe cold, and bring them back inside. The sowing advice is to move them to a cooler place after germination anyway. 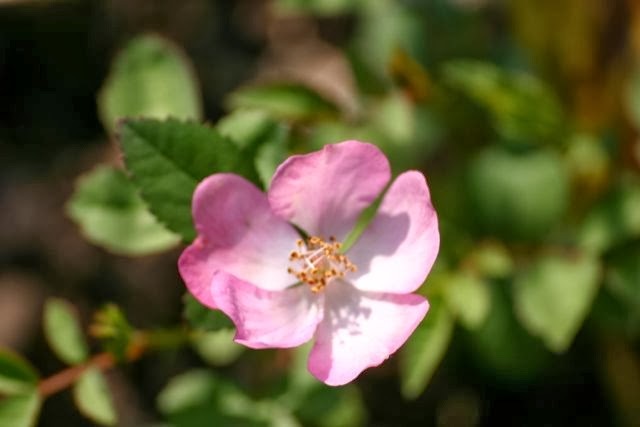 Rosa multiflora nana perpetua 'Garden Party' is a miniature rose, growing to about 25cm (10 inches) tall with a spread of 35cm (14 inches). It has been bred for improved germination, in 2013, making it supposedly easy to grow (watch this space ...). 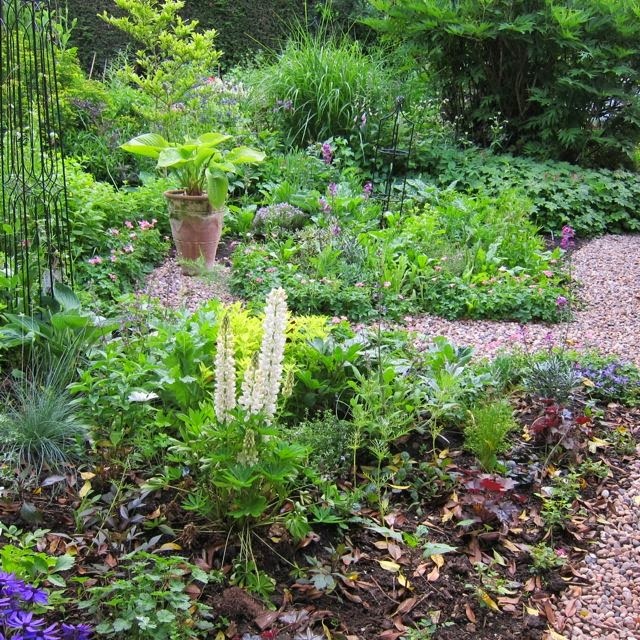 It is equally happy edging beds and borders, or growing in a container. 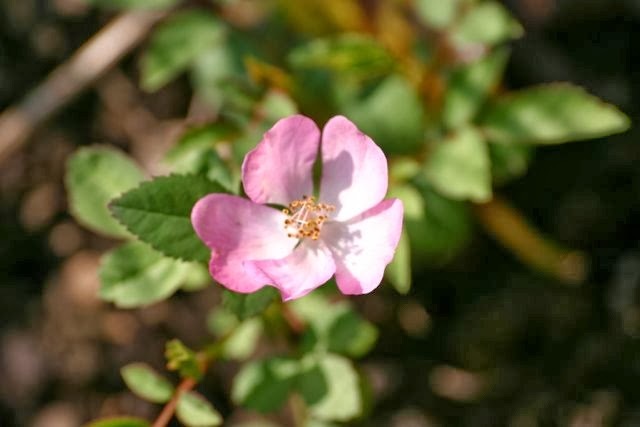 The flowers are produced freely and are produced in slightly different shades of pink, making an interesting display. I planted some in partial dry shade, as a weeny experiment, and they hung on in there and grew. Not as big as their luckier siblings, but grow they did ! Thompson & Morgan say that they need full sun, and mine grown in full sun were certainly happier. They also give the flowering season as June to September, whereas mine flowered sporadically way into October. 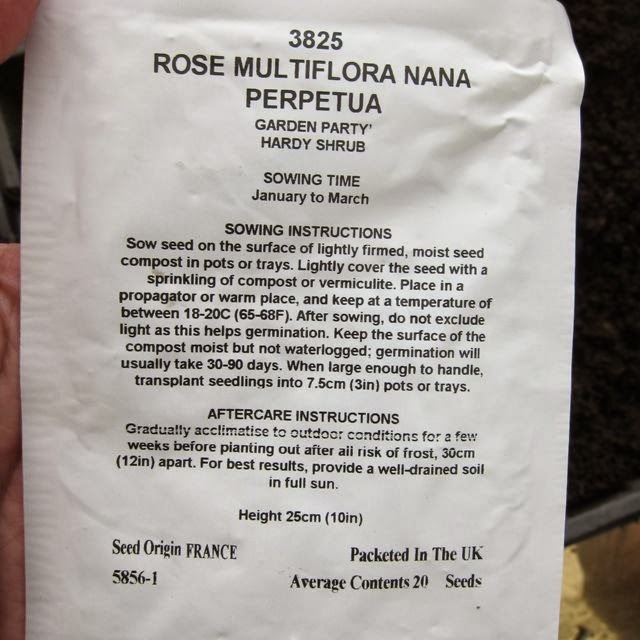 This is an extremely inexpensive way for me to grow a quantity of roses as the cost per packet is only £2.89 for 20 seeds, so even if germination rates are poor, it's still good value. As I recall 72 plug plants cost me around £20. Hah ! thank you T & M ... I actually counted 24 seeds in both packets ! So, off we go, on the roller coaster of a new growing season with its highs and its lows, successes and failures. 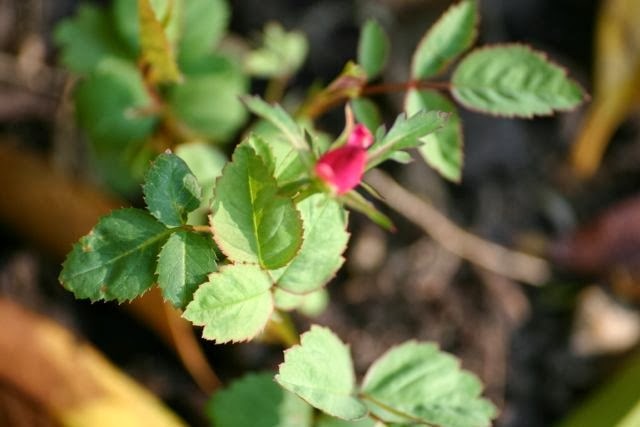 I wonder how long it will be until I spot my first little rose seedling ? 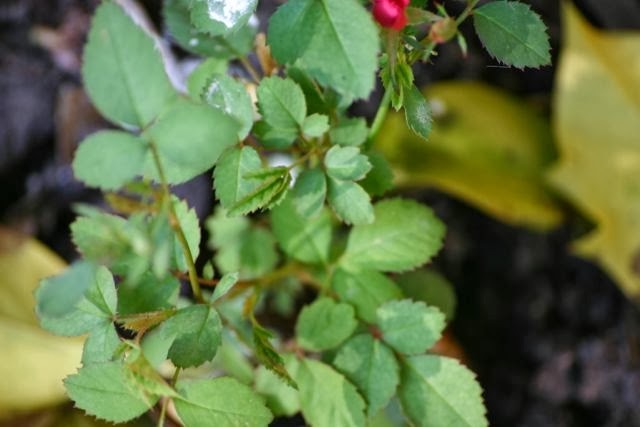 Growing roses from seed - interesting. I think we are encouraged to sow early so that when we fail we have to buy more seeds - twice a many sales? The garden centres are as bad selling HH plants too early. Have you thought of investing in a grow light. We have a couple of systems and it really helps with the leggy seedling issue. I shall pop across to yours Sue, and have a peep ! Hi Sue, thanks for that link, it was really useful! I've never thought of growing roses from seed, but I will certainly think about these. They are lovely. Thanks for sharing your experiences with them! Hi Wendy. I usually edge with geranium or Alchemilla Mollis, but after they are cut back following flowering they look pretty dreadful for a few weeks. My thinking is that the roses always look good and don't need much looking after. You're growing roses from seed??? WOW! I'm starting my grand lavender experiment Feb 1 and am waiting for my grow lights to arrive. I think it will be a great way to ward off the 'Waiting for Spring' crazies. I will be following your Grand Lavender Experiment with great interest !! I also think I need to buy grow lights !! Before I do grow stir crazy ! I too am impressed that you are growing roses from seed. You have far more patience that I have! For several years I did winter-sowing and window-sill seed-starting, but between my laziness and the fact that my results were only so-so (no pun intended), I have given that up. You seem to be quite a pro. Hi Sarah, I must admit I really enjoy growing from seed, but the downside is that the house has seedlings on every flat surface for months ! It tends to overflow from windowsills onto tables ! Hi Stephanie, it is a chore, not one that I thought you would have to do ! I have to do it maximise the light through the day and minimise the cold through the night ! I have been gardening for years and years, but oddly enough haven't done all that much experimenting with seeds. 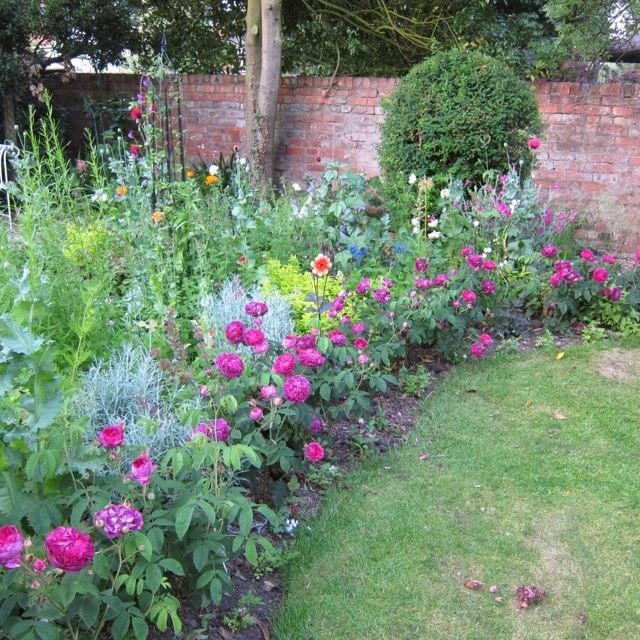 My attempts at growing plants from seed started in earnest about five years ago and I could identify with the sentiments in the opening of your post about your younger gardening self. Last year I started in mid to late March which seemed to work well for the weather here in Ontario. I have never started roses from seed and am curious to see how yours make out. Hi Jennifer, March is the best time to sow for most things, and is a good compromise between light levels and temperature. It is always tempting to start earlier and steal a march on the new season. 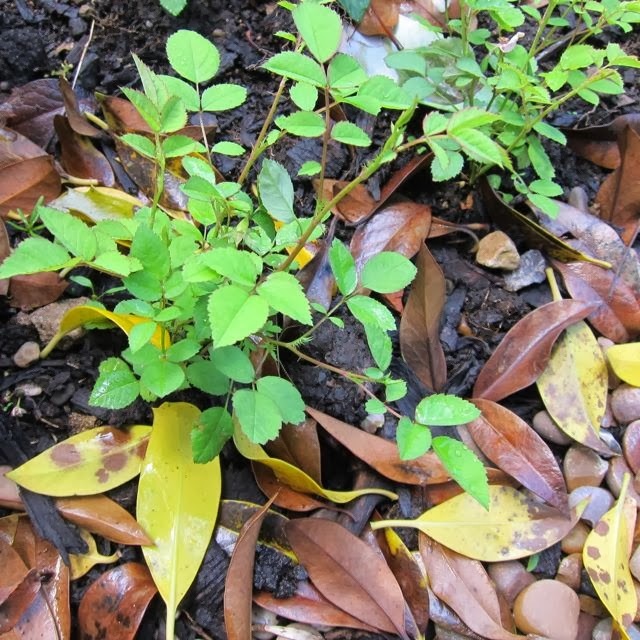 I am excited about the roses and yesterday saw that one seed that has pushed its way to the surface of the compost has started to root. fantastic! oh I know that musical seedling game well. There's never enough room for all the plants to get prime positions so around and around and around they go. Curious about your germinator, it has built in heat? I've used a heat mat previously but have to find something new this year as the product was recalled. Hi Marguerite, Musical seedlings is the game of choice throughout the early Spring in our house ! Yes, the propagator is heated and remains a constant 20 degrees. It was very cheap and I have had it for years. You can get more expensive ones which are thermostatically controlled, but I have had good results with my basic one. I have never used a heat mat, but I guess they do just the same job. I have just bought that seeds I think it would be better to put them in a cold place for a few weeks. my zone is 6, Europe. Hi jan, the seeds are pre-treated, by which I think they must be stratified already. Mine all germinated within about three weeks and I planted them straight away. 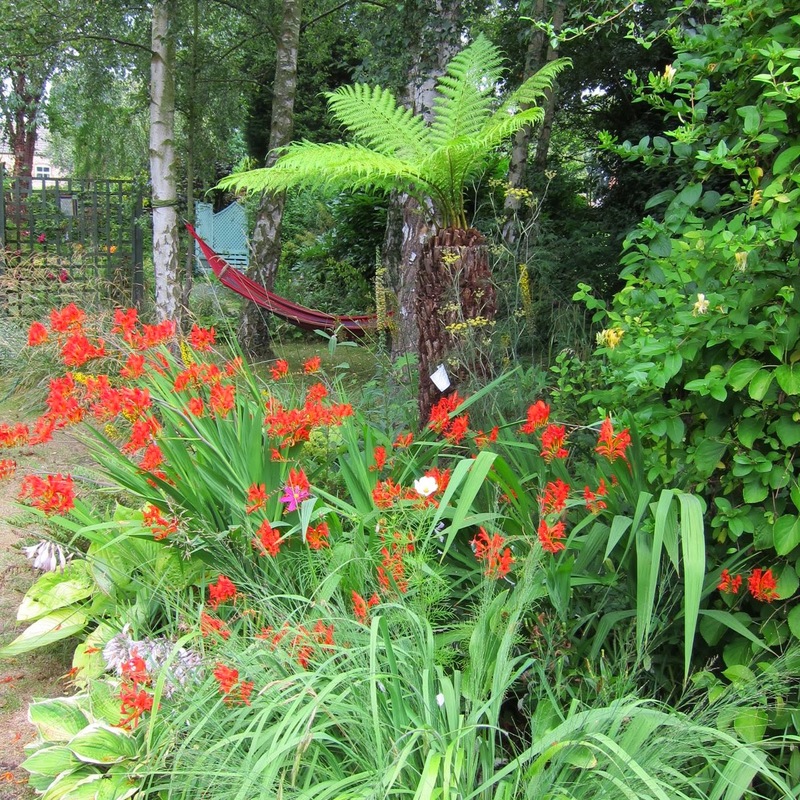 If you want them to bloom this year you need to give them plenty of growing time. I also have an article about growing them on the Thompson & Morgan website.